Felt is the oldest form of fabric and is becoming popular as folks re-discover the versatility and durability of felt fabric. Needle felting is a process of repeatedly piercing fiber with special barbed needles. These needles cause the fibers to become tangled, eventually making felt. Needle felting large volumes with hand tools is time consuming and often produces inconsistent output. With 800 felting needles, the FeltLOOM increases productivity while improving the quality of the end product. Felt starts with carded fiber in the form of batts or roving. 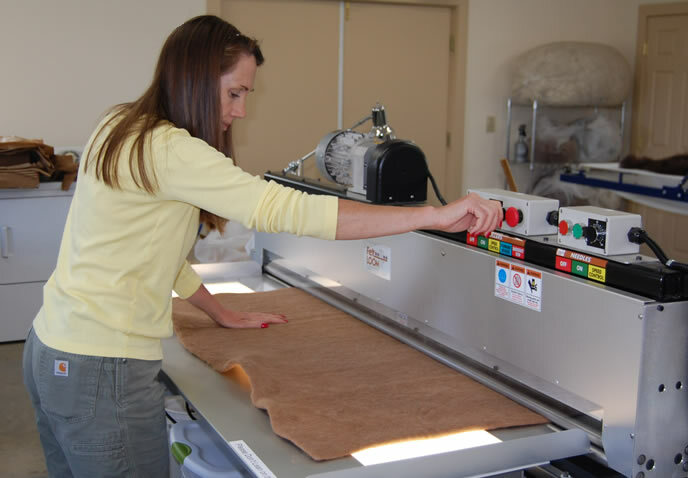 Although felt products can be made from fine fiber, it is an ideal use for coarser fiber and VFM&S typically uses “seconds” for felt that is not worn next to the skin, creating new products for fiber producers to offer their customers. Felt is ideal for rugs, insoles and similar products. The possibilities are endless! Felt can be unstructured (no fabric layer) or structured (felted onto fabric), and of varying thicknesses to accomplish the desired end product. Pre-felt can also be made with the FeltLOOM to then be finished with other processes. The FeltLOOM is 66” wide, allowing for the production of large felt pieces. Pieces can be made to your specifications. The FeltLOOM can also be rented by the hour. Come create your own amazing designs and products! The FeltLOOM is extremely easy to use and after brief instruction, you will quickly become productive. Roller speeds and needle speeds are individually controlled, giving you full control of the fiber and project to create consistent, high quality products. Staff is on hand to assist with any issues that may arise or answer questions. The FeltLOOM rental rate is $20 per hour. Click here to see availability and request a rental. Let the FeltLOOM help you easily produce non-woven fabric products to sell and generate more profits for your farms!